Tiger Woods has won the 2019 Masters Tournament. Woods trailed by two entering the final round, but came back to win his first major since 2008 and his first Masters since 2005. Tiger trailed the 62-hole leading Francesco Molinari by 2 entering Sunday and was down by as many as 3 shots. But then Molinari faded down the stretch, putting two in the water. Several others made runs, including Xander Schauffele, Dustin Johnson, Jason Day, Tony Finau, Patrick Cantlay and Brooks Koepka, but it was Tiger who made history. Woods entered the 11th hole where he was entering Sunday, -11 and a few shots back after a bogey on 10. His tee shots had started to fly right and things weren't looking great. But then came Amen Corner. And Molinari and Finau, playing in the final group with Tiger, found the creek on the par-3 12th. Molinari made double and suddenly everyone was back in it. Then Woods birdie the par-5s 13 and 15 and then 16 to go up and never look back. Are you a die-hard sports fan? If so, SUBSCRIBE to Chat Sports on YouTube for the latest news and rumors by clicking the button below! The shot on 16, as seen below, was nothing short of perfection. Tiger entered the 18th hole with a two-shot lead, as Koepka missed a chance cut it to one with a birdie in the group front of Tiger. 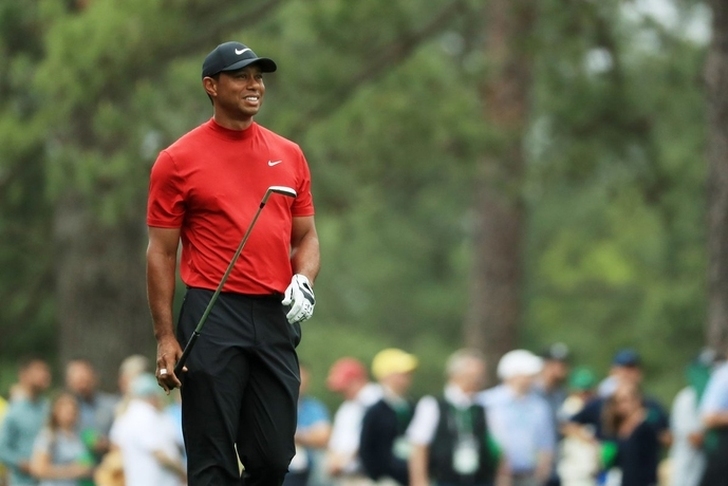 Needing just a bogey to win, Tiger made a bogey to secure the Green Jacket. It wasn't that long ago that the 43-year-old Woods was unsure if he'd even play again after numerous injuries. Now, the legend himself is back atop the golfing world with his 15th major championship. He tied the record for the longest drought between Majors with his victory on Sunday.